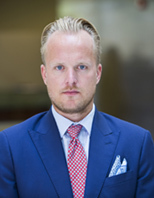 Mr. Herman Hildan is Managing Director - Investment Banking Shipping at Clarksons Platou Securities AS with global equity coverage of the shipping industry. Herman and his team covers 35 Companies within seven Shipping segments; Tanker, Dry bulk, Container, LNG, Car Carrier, LPG and Chemical tanker. Herman joined RS Platou Markets in 2009, was named Partner in 2011 and his shipping team has since won several awards. In 2014 StarMine ranked the Shipping team the number one stock picker for marine in the US, with a second place in European transportation. In 2015, the team also ranked among top 3 for best earnings estimate and stock picking in the Nordic region by StarMine. In February 2015, Clarksons' acquisition of the RS Platou Group was completed. Herman holds an M. A (Hons) in Financial Economics from the University of St. Andrews.